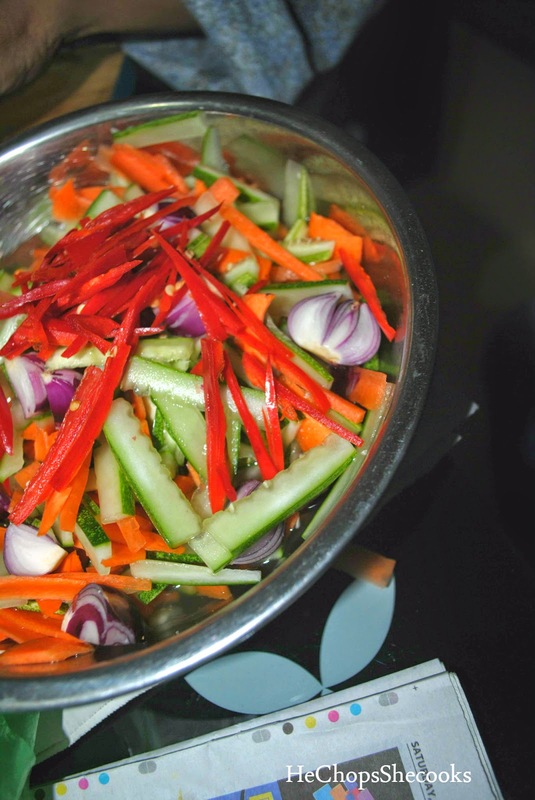 Acar is a common side dish in Malaysia.. It's like you have a salad for your side meal. Some of this acar you can find them at the Malay traditional wedding. 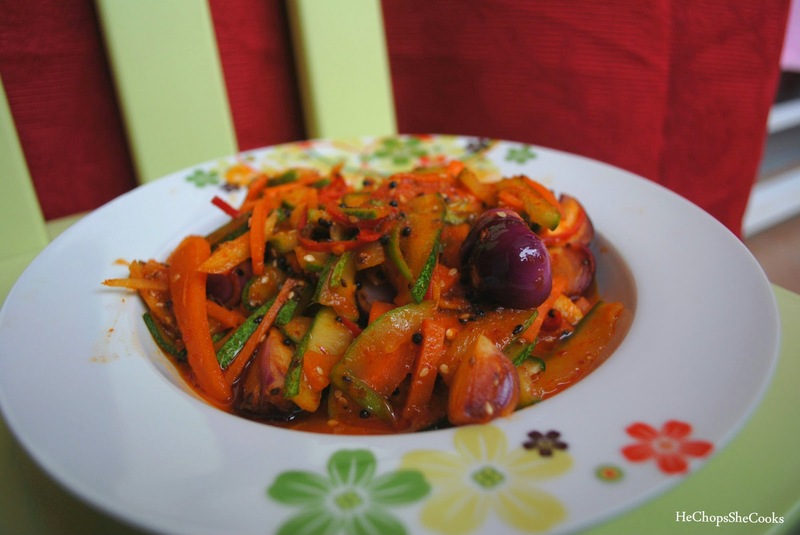 This recipe comes from my mum and she recently prepared this delicious acar at my house. I decided to share this recipe because it's one of the Malaysian favorite food too. It's simply getting them anywhere, sometimes the food stall sells them. To be honest, I only ate my mum's acar because I haven't found someone that make it so perfectly like my mum. Acar has two types; one is then cooked and another one is served raw. My mum made the cooked version and she able to keep the car stay fresh and crunchy even after cooking them. 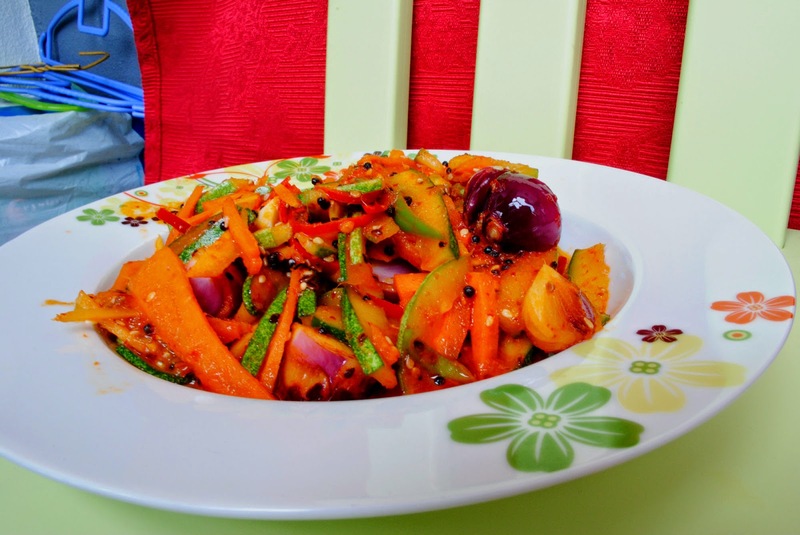 I love this acar, it contains whole small onion, mustard seeds, carrot and cucumber plus it is packed with flavors, crunches and healthy as well. It's nice to eat them with warm rice. Mix all these ingredients into the blender and blend them until smooth. 1. Slice and cut into strips, cucumber and carrot. Cut shallots and garlic into quarters. Deseed and slice the green, red chilis and ginger into strips. 2. Put all the slices ingredients into a big bowl and sprinkle salt and mix. Meanwhile, blend the dried chilis, lemongrass, shallot, garlic, galangal and candlenuts. 3. Wash the vegetables that has been sprinkled with salt and drained. 4. Heat 2 tbsp of cooking oil in a frying pan. Add chili paste and fry until fragrant. Add mustard seed and let it splutter. 5. Add 1 or 2 tbsp sugar & vinegar. Add the drained vegetables to stir for 5 minutes and turn off the fire. 6. Sprinkle toasted sesame seed and ready to serve! Have them with warm rice. Very healthy dish. Thanks for visiting my blog . First time in your blog am following u . Glad if u will back. Hi Benna, thanks for stopping by :) surely will follow you back.